No question about it, I have a fascination with Dracula. Not just Bram Stoker's book, but the myth, the legend, and of course, Vlad Dracul-a or Vlad Tepes. The Impaler. It was the subject of my first group read that I hosted at On the Ledge Readalongs last year and it continues to be something that hypnotizes me for its darkness, and frightens me just the same. (Dracul is the name of the father, and the -a at the end signifies "son of." Hence, Dracul-a, or Dracula). Vlad and his younger brother Radu were members of the Order of the Dragon with their father, fighting enemies of Christianity, specifically the Turks, the powerhouse empire of the day. In order to cease the warring, the Sultan holds Young Vlad and Radu as hostages for approximately five years. In Vlad: The Last Confession, C.C. Humphreys has invested a lot of time and research into crafting a version of the infamous voivode (ruler) of a tiny country in Eastern Europe. Although Bram Stoker immortalized the name, the actual man behind the legend is told in this version. It is centered on three crucial figures from Vlad's life: his lover, the beautiful Ilona; an unnamed man of religious counsel; and his both faithful and disloyal friend, Ion. Told in flashback during a somewhat public confession before a Cardinal of Rome, a few monks, and a member of the Order of the Dragon, Vlad's acts in life are recounted, shared and debated in a cold castle five years after Vlad's death on the battlefield. Questions are posed - impalement is horrible, but during this time, for this supposed cause, was it necessary? Did it not strike fear into his enemies, into the traitors within his own court? The arguments abound as the confessions continue, which is to be sent for review by the Pope. The remaining Order of the Dragon hopes that the Church will forgive what Vlad did on behalf of God. Brutal, medieval, vicious - yes. Do the actions solely define the man that was also a friend, father, teacher, and lover? An impossible question to answer with 21st century eyes. Thank goodness we don't live in that time, so who knows how we would have wanted the leader of a country to be. Let's be clear - this book is not for the faint of heart. Medieval torture is explicitly described, and the infamous moniker of "The Impaler" is so vividly drawn that when I first came to that section, I lost all my appetite for the dinner I had just started eating. Needless to say for me, I pulled the book closer and forgot all about my plate. After all, this time period seems like there was always war - one country fighting for another spot of land, or to crusade for one's religion, to defend one's honor. Death seemed to be everywhere, and never in a "pleasant" form. C.C. Humphreys is successful in richly describing a period in time that was fraught with despair and peril, while simultaneously revealing the man behind the legend and myth - a man who was conflicted, tormented by his own past, distrustful of others, hardened by his own horrific experiences with torture and suffering, and struggling with winning a war while watching deserters flee the ranks. It will never excuse the cruel actions, but perhaps it's a reminder to always look at history with more of a discerning eye and questioning nature. After all, somewhere in the middle of it all, might be the truth. Chris (C.C.) Humphreys was born in Toronto and grew up in the UK. Following his family's established footprint in acting, he has acted all over the world, appearing on stage as Hamlet, on NBC as Caleb the Gladiator in "AD - Anno Domini," and Jack Absolute in Sheridan's "The Rivals." He has written seven historical novels including The French Execution and a trilogy for Young Adults called The Runestone Saga. 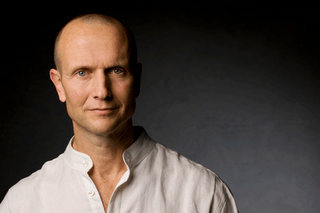 Not only is he an actor and writer, but he's also a fight choreographer. Pretty cool, huh? This is my fourth selection for the RIP Challenge VI hosted by Carl at Stainless Steel Droppings. While I've completed the level of Peril the First, I'm certainly not finished in reading this type of story. 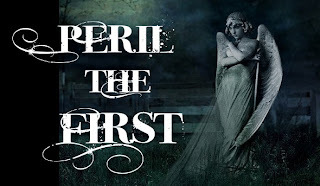 It's just now getting cooler in Virginia Beach, Halloween is right around the corner, and I've always loved the creepy, the spooky, and the horror in my books and movies. I think I'm just getting started. You can read more RIP reviews from other participants by clicking here. This post made me excited as I am a Dracula groupie too! This book has been added to the wishlist, Vlad is fascinating. I got a book out of the library at the weekend that you might like: From Demons to Dracula - The Creation of the Modern Vampire Myth. Haven't had a chance to read it yet but it looks good from skimming. Sam - Let me know when you get a chance to read it, would love to get your thoughts on it. I will also look for the book you recommend - always nice to read about the things that go bump in the night. When I was a kid, I hung garlic on my bedpost! LOL Now, I think of Vlad as extremely interesting. Wow, what an endorsement. I will put this book on my TBR list. From what I read about Vlad, his acts, as horrendous as they were, weren't out of line with other rulers. Did the author mentioned anything about that? I read this book shortly after I finished listening to The Historian and really enjoyed it. Glad you did as well. Sadly I was one of the faint-hearted, faint-stomached wimps who gave up on Vlad. The very part you mention was all too much - I couldn't get out of my head for days. What I read was very good, though. Glad you enjoyed it. Kittie Howard - Too funny! I was afraid of Dracula as well and am completely drawn to the true story behind it all. Love the Gothic folklore that all goes along with it, too. Nise - It would have been a great companion piece after reading The Historian. I am listening to the audiobook of The Historian now (3rd time reading it), so I'm glad to have this book as a foundation for it now. Cat - Those scenes are extremely tough, I know exactly what you mean. I'm still thinking about them. Well written, and absolutely horrifying. I shudder again! This sounds like a good companion for The Historian, so I am glad to see that one on your sidebar! I share your love of Vlad/Dracula. My husband thinks it is weird. I love when a book excites me!! This doesn't happen th at often so when it does it's wonderful! It's nice that you have found such a book and that it spurs you on to other reads! The last time that happened to me was when I read Drood and suddenly I was a Wilke Collins fan! I love reading reviews that really excite a person.. well done! I totally enjoyed this post. I know only glancing bits about Vlad, but what you have read in this book really piques my interest and makes me think that I would probably enjoy this book (if one can enjoy books that feature impalement). I think the subject matter is fascinating and this is one that I need to read. Your enthusiasm over this book is sort of contagious, Natalie! reviewsbylola - I'm listening to the audiobook of The Historian this year. I've read the book twice and loved it each time, so I think the audio will be punched up even more by reading Vlad. deslily - I can't believe I haven't read Wilkie Collins yet. Drood is also on the list - been meaning to pick them all up, thanks for the reminder. Veens - Glad you enjoyed it; much more to the Dracula we all know from Mr. Stoker, huh? I love learning as I read! Zibilee - It is pretty gruesome in specific sections, but I enjoyed the entire story. Well written and it moved fast, too. If you read it, let me know what you think. I have this on my TBR pile. I really should read it because I am intrigued and even the guy flipped through it when it wasn't actually on the shelf. Since he is not a bit reader, that is a huge deal! I don't always love books about vampires but I love books with Dracula. Although I think I can pass on the torture scenes, it still sounds like a perfect October book. I'm tempted, but my other books would string me up if I brought this book into the house! This sounds delightfully horrible!! Love learning the little tidbit about Dracul and Dracula. We have Romanian neighbors and I'm always teasing them about vampires. I'm sure they hate me a little bit because of that. Even though I don't like really scary books, I do really enjoy books about Dracula so I really want to check this one out (with the lights on of course)! Thanks Natalie! I will be adding this book to my wish list. I am the exact same way. 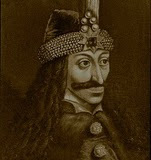 I used to think I had a fascination with vampires, but I realize that Vlad Dracula is really what interests me. (I even have a secret wish to get a tattoo of the dragon from the Order of the Dragon.) 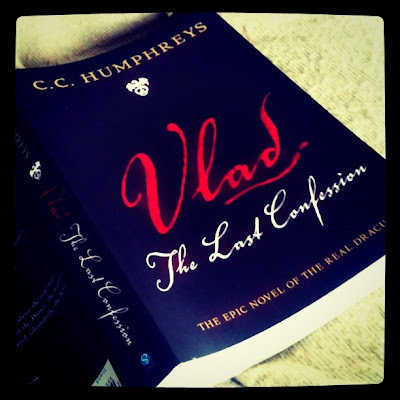 I read and *LOVED* VLAD: THE LAST CONFESSION. It was so well-written and really does make you feel sorry for him, as he was a victim of circumstances more than anything (IMO). I just finished listening to the audio of THE HISTORIAN as well; while it is a re-read for me (I've read the print version three different times), I have an even greater appreciation for that book as well now after having read the Humphreys book!